Georg Simmel’s essay, “The Metropolis and Mental Life” was written in 1903, but remains largely relevant today, analyzing the effects of the city environment upon the individual. Exploring Simmel’s findings in a more modern and technologically connected context, in this case an ad campaign for the Bugaboo Bee stroller, reveals that his theory of the modern metropolis and its effect on man’s social consciousness and identity is both enforced by current metropolitan and online environments, and inadequate for them. The often highly intimate nature of social media content does not fit neatly into Simmel’s paradigm. The presence and behavior of children in urban spaces tends not to correspond with Simmel’s descriptions of an inevitable lack of social consciousness. The nature and concept of social capital obfuscates his principle of objective reckoning, and the way corporations capitalize on the individuality and online activity of social media participants blurs the line between objective and subjective behavior and judgment. Ultimately, as the spectrum of stimulations leans toward the intimate, and user-content-saturated realms available in social media, objective reckoning is less likely to be based on tangible features, though more likely to be entrenched in social capital, and social consciousness seems less likely to experience the dearth that Simmel described. Simmel’s essay claims that his inquiry into the meaning of specifically modern or metropolitan life answers “the question of how the personality accommodates itself in the adjustments to external forces.” The essay largely explores the psychological coping of individuals to the high level of stimulus in urban settings. Simmel claims that the big city is dominated by fiscal objectivism (as opposed to individual/emotive centered subjectivism) and that human interactions in cities become short, impersonal, rational, and instrumental, lacking the sense of community found in a small town. “The metropolis exacts from man as a discriminating creature a different amount of consciousness than does rural life.” Thus he claims that the inner life of city dwellers is more intellectual than emotional. People value time and money, and the easily measured. Thus more qualitative values are reduced to what can be “reckoned” and this leads to what Simmel calls the “blasé attitude” of many city dwellers, a defense mechanism against overstimulation that potentially alienates them from meaningful interactions through their own indifference and discrimination. Simmel also emphasizes that, paradoxically, metropolitan dwellers have an elevated need for a sense of unique, noticeable, recognized and valued identity. “The carrier of man’s value is no longer the “general human being” in every individual, but rather man’s qualitative uniqueness and irreplaceability.” Their sense of identity will increase in importance to them as the level of stimulation rises, and that in city environments the need to feel incomparable or unmistakable will lead to distinct behaviors far less common in more rural communities. Interestingly, each of these points made by Simmel are illustrated in the Bugaboo Bee online ad campaign. Bugaboo is a Dutch mobility company primarily manufacturing high-end strollers. Founded in 1999, the company has placed a high priority on their online presence and online marketing. In January of 2003, 100 years after Simmel’s essay was published, Bugaboo released the Bee, touted as a “complete urban stroller.” The company followed up with the “Bee in the City” campaign platform which was released in June of 2012 and which allegedly demonstrates the ways in which the Bee’s design is well suited for navigating cities. But city living is never clearly defined in any of Bugaboo’s campaign materials, and the implications of what differentiates a city environment are only inferred. The metropolitan focus and assumptions of Bugaboo’s Bee campaign mirror and challenge Georg Simmel’s essay. In analyzing the content of the Bugaboo Bee campaign, it is helpful to introduce a further concept, outside of the scope of Simmel’s essay but directly related to points in it. This is the idea of “social capital.” The term was introduced by Alexis de Tocqueville as early as 1890, but was not widely used until the 1990s. Robert Putnam’s definition of social capital is “the collective value of all social networks and the inclinations that arise from these networks to do things for each other.” Pierre Bourdieu also wrote extensively about the relation of social capital to upward mobility through socially recognized class distinctions. This idea becomes relevant relative to Simmel’s exploration of intellectualism and objectivity, as individuals are making decisions and “reckoning” value not only in terms of money capital, but in terms of social capital as well. It is also very relevant in exploration of the metropolitan need for incomparable identity. Choices, objects, and actions that are perceived to increase the concrete particularity or uniqueness of one’s identity might be given reckoning weight in terms of social capital. The ability of a product to imply a certain economic, social, or cultural status becomes in itself a feature of that product, and an image-conscious consumer is likely to take that feature into consideration as they valuate potential purchases. Bugaboo’s campaign for this “total urban stroller” can be considered in three separate parts. First is the product website for the Bugaboo Bee where the main, traditional, video advertisement can be viewed and product specifications and features are explorable. 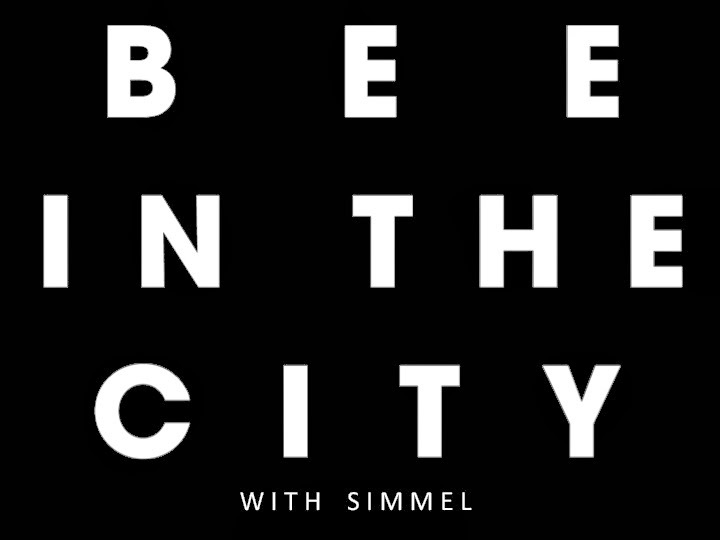 Second is the ancillary website and home base of the social media campaign “Bee in the City”. 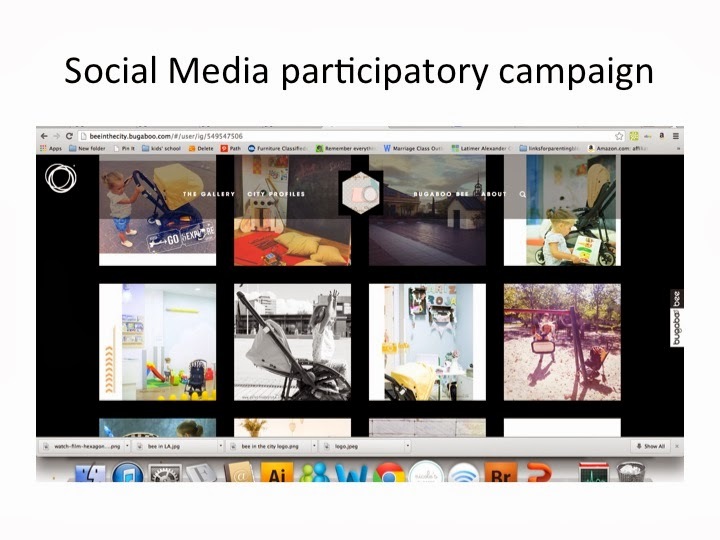 This website has instructions for participating in the social media campaign, allows access to content created by other users, and primarily houses six 2-3 minute videos, produced by Bugaboo, exploring individual families using the Bugaboo Bee stroller in six different large cities around the world. The final part of the campaign is the social media campaign and its invitation for users to “create their own [searchable] gallery” of bugaboo bee images and tweets by using the hashtag #beeinthecity. For users that are following the company blog or twitter feed there are also games and contests with bugaboo strollers and stroller accessories as prizes. These three distinct components of the campaign form a spectrum of material determined by several factors. At the product website end of the spectrum the company has complete control of the content. There are minimal representations of human beings, and the emphasis is on features of the stroller. At the social media end of the spectrum, the company has no direct control over content, and humans, their personalities, their implied social status, and their faces become a stronger point of focus than the stroller itself. The product Website has as its foremost and most prevalent feature the 44 second advertisement video. The ad begins by showing the empty Bee stroller rolling out in front of a blank video screen. Then, in sync with very electric, percussive music the stroller appears to move in stop-motion, its movement is relative to stop-motion images played out on the screen of navigating city sidewalks. The effect is that the stroller appears to be navigating the city environment, but with the filter of the screen in place. While there are clear manifestations of crowds of people, none of them are in focus and very few of them are fully embodied. We see most of them from the waist down, presumably the perspective of the stroller. There are three other strollers present in the video, all of them the Bugaboo Bee in different colors. The seemingly self-animated stroller in quick succession demonstrates all the features unique to the Bee. The video ends with a shot of a paved path in a wooded area, the first green space shown in this ad. There is also only one other person, a jogger, within the frame at that point. After this scene is introduced, there is a jump-cut and the stroller is (suddenly) no longer in front of the screen, but rather on the screen, rolling toward the horizon. What this ad does less effectively, perhaps, is to capitalize on social capital or incomparable identity, and that void appears to have led to the creation of the Bee in the City campaign. The Bee in the City Profiles still contain many elements of decreased consciousness and intellectualism, but by moving the content creation into real spaces with real families, a far more organic and human effect is achieved. Despite the still-tightly edited and highly controlled nature of the visual content, a very different aesthetic experience occurs. There are profiles from 6 cities: Berlin, Tokyo, New York, Barcelona, Amsterdam, and Los Angeles. The subjects of these short films were arguably chosen to be representative of the ideal consumer for this company. A product as expensive as a bugaboo stroller (the basic model of the Bugaboo Bee starts at $650), usually involves selling an idea as well as a product. When a low-end umbrella stroller can be purchased for under $30, it can be assumed that someone who spends more than 21 times that amount is buying more than a stroller, they are buying social capital – and a contribution to their sense of identity of self. The value of the product then becomes doubly quantifiable. A consumer can reckon the value of the product based on it’s tangible features relative to its price, but also by the social capital of the implied perceived social status of the product within the public, and the value of that status symbol to the consumer relative to its price. Even the user-content end of the campaign spectrum is devoid of any of the aesthetic blights inevitably present in real cities. Consumers appear to be willing to play along with Bugaboo’s brand-centric filter, creating an idealized picture of city living even in the content they create. All things unattractive are filtered or edited out of this virtual existence. There appears to be a very curated identity Bugaboo wants associated with this product. Palpable evidence of a very specific cool-factor and clear parameters of an elite target audience run throughout the campaign. The proscribed consumer is very design-conscious, economically stable, has plentiful discretionary time, is paid or consulted for their unique sense of taste, is part of a dual-income household, and is comfortable with a visibly unique self-identity evidenced in dress and grooming. This is distinctively not a product being marketed toward cookie-cutter soccer moms. A consumer wishing to distinguish herself may feel that this product would communicate that she is not one of the crowd, but belongs rather to an elite class of design-savvy hipsters. The existence and highlighting of stroller accessories from the brand’s Andy Warhol collection make this correlation unmistakable. Bugaboo has very carefully chosen the subjects for these profiles then, to be in keeping with the “identity of self” that they want their customers to believe that they are buying. They are all involved in design or social media careers (or both). They all visit museums or art galleries within their short profiles. They are also solidly selected from within a niche of art and design centered living. None of them appear to be single parents, or show any inclination toward making decisions based on economic restrictions. These are, as curated, people who are maximizing their urban experience. They are maximizing benefits of city living (access to culture and design) while seemingly impervious to its challenges (cost of living or tight quarters). They also appear to be maximizing benefits and minimizing inconveniences of parenting. There is no indication that they’ve had to make accommodations in their adult-centric lives by introducing children into their families. As we observe these individuals, there are invariably mixed patterns of the degree of interpersonal consciousness displayed in the adults. We do not see the all-inclusive blasé attitude Simmel described, but there are elements of it. Jarno (profile #5, Amsterdam) actively avoids other pedestrians in one shot, but is also seen congenially chatting with his shopkeeper friend Nielleke. He appears to be utterly alone with his son inside the Stedelijk museum, but is then seen chatting with the barista while ordering a coffee afterward. It is possible that blasé is too incompatible with the vibrancy of unique identity the brand is seeking to establish. The profiles that include ambulatory children are even more mixed in the consciousness portrayed. Joy’s family (profile #6, Los Angeles) actively engages with farmer’s market musicians and a vendor playing hopscotch. And the baby-wearing that occurs in profile #2 (Nyoro and Rinko, Tokyo) introduces and heightens interpersonal consciousness, as do scenes in that profile where children are apparently oblivious to the personal space of others. Indeed, once children and their own volition are introduced, it becomes complicated for the films to keep the focus on the adults’ experience with the stroller, which is really what they are trying to sell. The children’s greater engagement with their environments becomes a secondary, more ephemeral focus of the films and a more difficult, though not altogether impossible, factor to brand and sell. Likely for this reason footage of the children is kept to a minimum in each of the City Profiles. Simmel’s description of the metropolitan man simply doesn’t ring true for the metropolitan baby, “The metropolitan type of man…exists in a thousand individual variants- develops an organ protecting him against the threatening currents and discrepancies of his external environment which would uproot him. He reacts with his head instead of his heart.” These children are, at best, still developing that protective organ. Their response to their environment is far more conscious and sensitive than that of their adult counterparts. Their unpredictable interactions with their environment are likely why we see so little of them in these profiles. (Phoenix, profile 5, appears to do nothing but sleep in his stroller). It is far more difficult for behavior with such a high level of consciousness to be converted into a marketable, relatable identity directly corresponding with the product. Simmel’s assumption that the metropolitan man has already developed callousness toward the quantity of humanity he encounters is oddly silent about just how and when he becomes that way. It appears that metropolitan kids, despite having only known the city environment, do not conform to Simmel’s expectations for urban behavior. Callousness is, then potentially as much an adult tendency as a city-dweller’s tendency. There is a strong theme of incomparability, reminiscent of the paradoxical need described by Simmel, running throughout these profile videos, as each profiled parent appears to be firmly in control of their own destiny and the design of their environment. Based on what is presented it appears that discretionary time is a limitless resource for these people, and that they use it to enrich their incomparable, unique, value-laden lives with culturally rich, rather adult-centric activities. In short, they are the kind of chic that a consumer might be willing to spend nearly $700 to self-inculcate. This imbuing of the product with implied social capital is likely to be an effective marketing tool when considered relative to an audience fitting Simmel’s description of a metropolitan man. “Life is composed more and more of these impersonal contents and offerings which tend to displace the genuine personal colorations and incomparabilities. This results in the individual’s summoning the utmost in uniqueness and particularization, in order to preserve his most personal core. He has to exaggerate this personal element in order to remain audible even to himself.” Bugaboo seems to believe Simmel’s claim that urban men (and women) are exceptionally desperate to define their identity with exaggerated, even exorbitant elements. The company recognizes a willingness in its customers to invest in an otherwise rote product if they can purposefully absorb it into their constructed identity. They cater to this impulse. 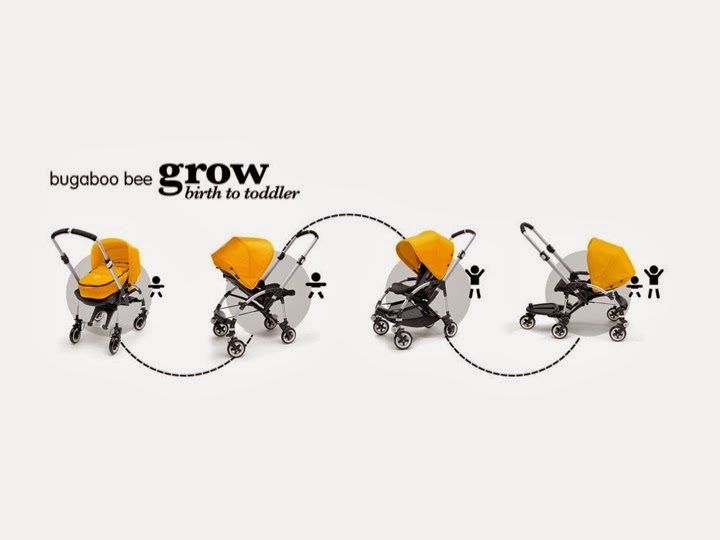 As selling the consumer on the social capital (or “cool-factor”) of this product becomes as important as demonstrating its tangible features, the extension of the Bugaboo Bee advertising campaign into more user-content based social media seems enormously effectual. The invitation to consumers to essentially become a part of the brand, and ingrain it into their own personal branding certainly reinforces the idea that this product has the power to positively alter the identity of its owner. But the social media platform created by Bugaboo also creates an augmented sense of control and particularity for those who use it. Each participant who uses the hashtag #beeinthecity on either of the larger social media platforms Twitter or Instagram automatically has created for them their own gallery on the Bee in the City website. This empowering invitation to consumers to cultivate and curate an identity for themselves, tied to this product, is likely to touch a powerful chord with an urban dweller wrestling with the kind of insecurity Simmel describes. These social media platforms, and the potential they create for interacting with a larger group of prospective peers than the pace of physical city life may facilitate, also enlarges the sense of identity for users, for “Man does not end with the limits of his body or the area comprising his immediate activity. Rather it is the range of the person constituted by the sum of effects emanating from him temporally and spatially.” The sum of those effects can certainly seem amplified when they are instantly shared with a receptive virtual audience. In fact, participation in such a platform seems to simultaneously intensify and circumvent different factors of Simmel’s metropolitan inner-life. On the one hand, online social mediums dramatically increase both the pace and intensity of stimulation available to users, and very likely affect the level of sensitivity and consciousness in comparable ways. But conversely, in a campaign like this there is an increase in the types of affirming, personal interactions that seem poised to fill the need for “intimate emotional relations between persons…founded in their individuality.” The potential to have an increase in human interaction that is disproportionately steeped in affirmation, like-mindedness, and intimacy (relative to interpersonal experiences in a public urban area) creates an environment of stimulation that does not foster a proportionate decrease in social consciousness. So while the Bugaboo Bee campaigns seem to be about facilitating the needs of families, they are more effectively fulfilling a goal of creating an illusion, or possibly even a reality of social capital for the adults considering this purchase. The material in the campaign is ultimately only nominally about meeting physical, practical needs of the children using the products, and far more about meeting emotional, social, and psychological needs of the adults pushing them around. While children are mildly present in most of the Bee in the City portion of the campaign, they are primarily tropes, and their wills, interests, or volition are invisible compared to that of their parents. The adult need for an incomparable sense of self in urban environments becomes the ultimate driving force and selling point of the ad campaign. As one looks across the spectrum of the entire product campaign, the trend is that the less direct control the company had over the production of content, the more the campaign becomes about lifestyle and identity and less about product features. Once fully immersed in the social media end of that spectrum, it no longer matters that the Bee is a “complete urban stroller,” it matters that is a “chic stroller” poised to positively affect the identity of the consumer. Bugaboo seems to be eager to subversively embrace the cool-factor while purportedly focusing on more tangible features. This same spectrum also demonstrates a marked change in the appearance of identifiable embodied persons. As the product information website and video have a notable lack of human bodies, at the social media end of the spectrum, the twitter feed is bursting with faces and their personalities. It appears that as social media platforms are used to fulfill the need for establishing unique, unmistakable identity, then the increase in stimulation available there may not result in a proportional decrease in consciousness. Based on this example, many of Simmel’s observations about urban life still ring true, but had he been able to observe the hyper-connectedness of the Internet and social media, he may not have restricted his concern about overstimulation to the city dweller. His principles of filtering and reckoning are relevant for any person attempting to discriminate and filter the quantity of content available online, regardless of location. The intensely social and personal nature of many social media platforms may also have given him pause. There seems to be a gap in his 1903 theory when the content of the stimulation is deeply personal and entrenched in social capital rather than the impersonality of a money economy, as is evident in social media in the early 21st century. Applying Simmel’s own theories to cover this gap, we find a tension of overstimulation and fiscal reckoning versus intimacy and unique identity that can be applied beyond the Bugaboo Bee campaign to the evolving world of online social and commercial media. Simmel, Georg. (1903, Copyright 1950), “The Metropolis and Mental Life” (The Free Press, New York) Copyright 1950.